Staff Appreciation Lunch. $$$ Donations needed! Home / news / Staff Appreciation Lunch. $$$ Donations needed! Because the Brentwood staff are AMAZING! 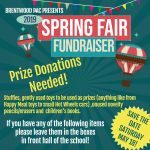 Brentwood Elementary PAC will be hosting our Staff Appreciation Lunch on Thursday, May 9, 2019. The students from Stelly’s Culinary Program will be crafting a delicious lunch for staff to enjoy. We are accepting donations by cash or cheque to fund this event. You can place your donation in an envelope and return to your classroom teacher or leave it in the silver PAC box, located in front of the office. Please have all donations handed in by May 1, 2019. If you or your child would like to send in a card or picture for a particular staff member we will make sure it is passed on for you! !